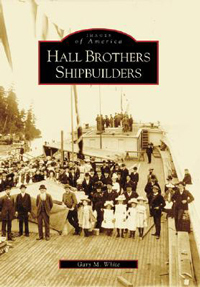 Maritime researcher and historian Gary White turned 30 years of research into The Hall Brothers Shipbuilders (2008). The book documents the history of the renown shipbuilding family and their sailing ships - considered to be among the finest on the Pacific coast. White's books is filled with facts and a plethora of photographs guaranteed to delight wooden boat fans. Says one reader: "This book is very well researched, well written, and beautifully illustrated. It should be part of every fine maritime book collection."